Markets are rolling higher like no tomorrow. 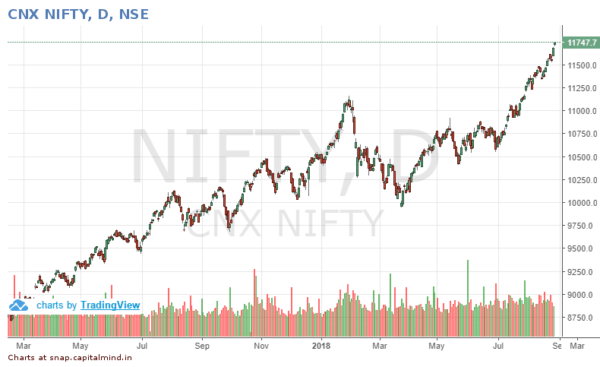 Nifty 50 is up 11% for the year and while the Nifty Small Cap 100 and Nifty Mid Cap 100 aren’t in the same line-up, markets have shaken off the weakness we saw earlier this year and now seem all set for another rally to higher levels. One of the key drivers of this rally has been retail individuals who have embraced mutual funds like never before. But while the 7 – 10 thousand crores a months is a significant amount of money, in the overall scheme of things it a tiny drop in the ocean. Our market capitalization is a whopping 140 lakh crores. There is the EPFO which is buying stuff every-day in an attempt to diversify from being bond only and having no withdrawal pressure, their investment could keep coming in, come rain or shine. But once again, they are also just around 2-3 thousand crores per month. While FII’s have seemingly slowed down their selling, they are still selling. At last count, they have sold nearly 37 thousand crores since the beginning of this year. Does it seem like stocks are going too far? The size of the Indian Inner wear market is estimated at around 28 thousand crores. Page Industries alone commands a market cap of 40 thousand crores with momentum chasing it all the way. Then again, when money keeps chasing limited supply, even ordinary companies can become extraordinarily expensive, forget about market leaders which are always in short supply. Public sector Banks have been the key lenders to the Indian corporate sector is in doldrums with every quarter seemingly worse than their last. While private sector banks have ramped up, they are more happy to provide a personal loan than commit to long gestation project that has immeasurable risks. The Power sector which has been facing issues for quite some time is now coming home to roost. Banks and Institutions have exposure to Rs.3 Trillion which are close to being called out as bad loans. If they go for liquidation, expectations are that the lenders will recover very little. The size of the bad loan pie will increase substantially. And then, it’s not secular, this rise in the market. Just before markets peaked in January of this year, nearly 78 of every 100 companies listed on the NSE was trading above their 200 day Moving Average. Today when we are much higher than the January high, just 31 of every 100 stocks are trading above their 200 day Moving Averages. This isn’t surprising given that Nifty Small Cap 100 still trades 21% below its all-time high while Nifty Mid Cap 100 trades 10% below its all-time high. But on a longer term, things look very different. 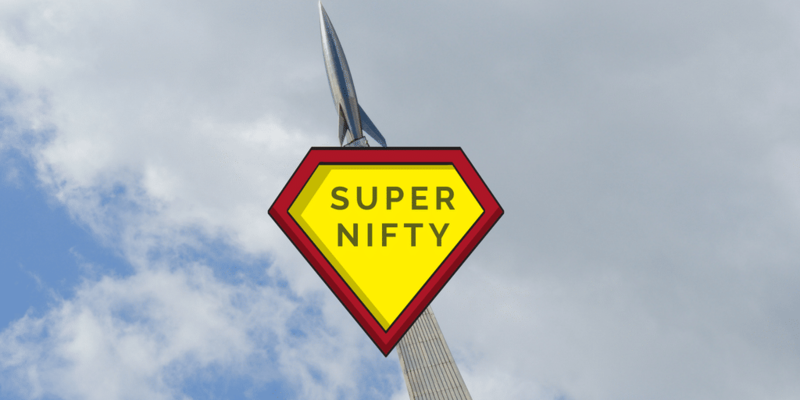 If September of 2013 is taken as the starting point, Nifty 50 still has a lot of ground to cover before it can even meet the performance of the Small, Mid and Next 50 Indices which are bunched up way higher. There is nothing so disastrous as a rational investment policy in an irrational world said John Maynard Keynes and applying historical rationale for the current market valuation may continue to mystify and confuse. 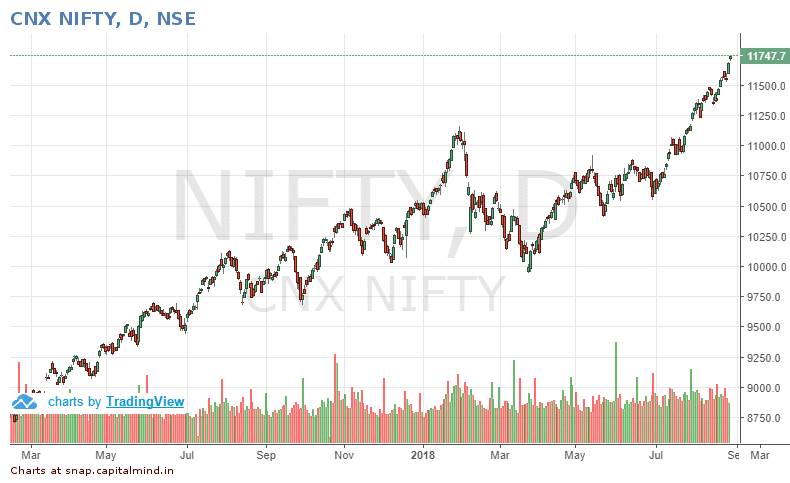 Markets revert to the mean all the time, even Nifty Pharma – the one sector that everyone loved to hate is now at its 52 week high, the first such test since 2015. Nifty for now carries the momentum and its suicidal to think that one can time the peak, yet peaks do happens when one least expect it to. While global trade war fears have abated, trade war itself hasn’t. China is a country that can get caught in the perfect storm with falling exports thanks to trade restrictions on one hand and defaults on its premier One Road – One Belt where investments have flown without regard to commercial concerns. The first sign of a problem seems to be already out there as Bonds issued by Chinese companies – both private and quasi government backed are starting to default. As on date, Reuters reports that defaults have now risen to $6.4 billion. While that is still small change, tornado’s can start with just the flap of a butterfly wing. The Indian growth story has a long road ahead and should provide plenty of opportunities for the discerning investor – but pay more for fear of missing out and you could actually miss out on wonderful opportunities when it comes into play. It’s not an easily decision to make, but at the moment it would simply be best to participate, but leave enough cash on the table to participate if there is a correction. It’s never a good time to predict when markets will turn. What’s worked recently is to actually ignore the facts – no matter what happens, just buy. This strategy is always wrong at the end – which strategy isn’t – but it provides a meaningfully happy feeling if you’re with the trend, and a feeling of being left out if you decided to stay out. The Chinese curse is: May you live in interesting times. We’re cursed, indeed.